In Books & Films, Travel. When I heard about the Terry Pratchett exhibition being held at Salisbury Museum, being an avid Discworld fan I knew I had to go to see it. A trip down to Southampton provided me with the perfect opportunity to stop in Salisbury for the night on my return journey (Salisbury being just 2 stops from Southampton on the Portsmouth Harbour to Cardiff Central train). Salisbury Museum can be found in The King’s House, a Grade I listed building with a history stretching back as far as the 13th century, situated opposite the west front of Salisbury Cathedral. 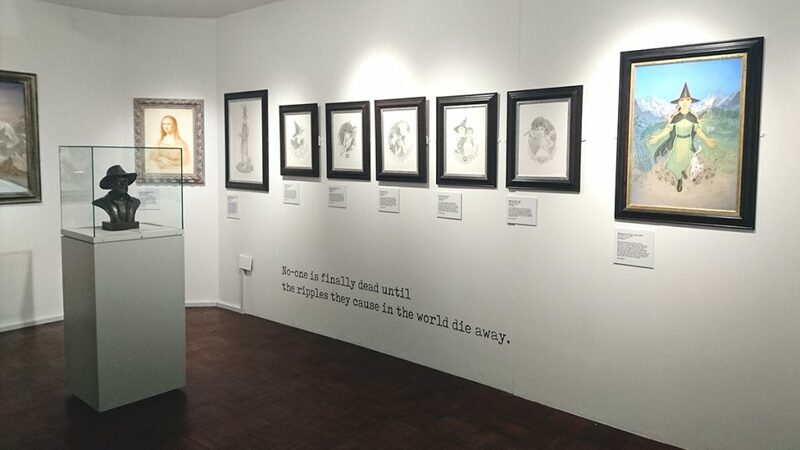 Presented by The Salisbury Museum, The Estate of Sir Terry Pratchett and Paul Kidby, Terry Pratchett: HisWorld is an exclusive major exhibition based on the extraordinary creator of the Discworld series. 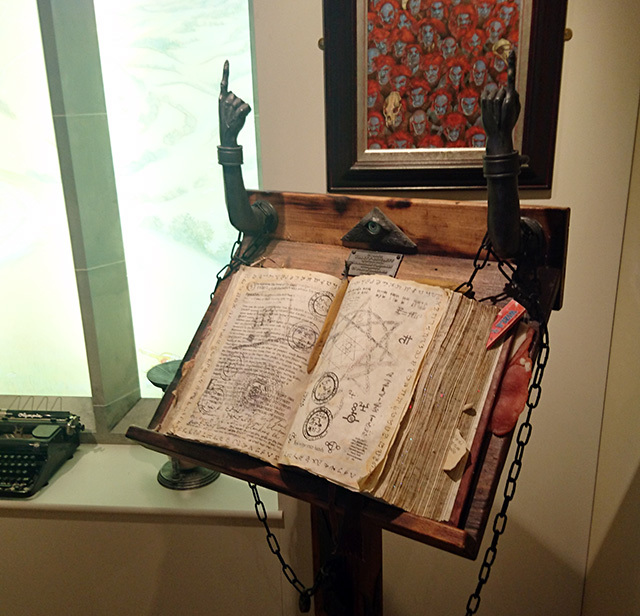 The exhibition is a must-see for any Discworld fan. It features Terry’s own treasured possessions, artwork by the man himself and over forty original illustrations by Paul Kidby (who I now realise was there viewing the exhibition at the same time as I was. I thought it might be him, but he was with family and I was too shy to say anything!). In case you didn’t know, Paul Kidby was Terry’s artist of choice. He perfectly captures the personalities and characters in the books. Paul’s artwork adorns the walls of the exhibition and provides a perfect accompaniment to this unique and wonderful exhibition. 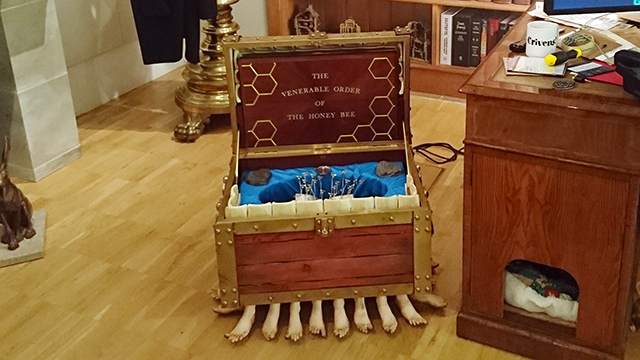 I stood in awe in front of Terry Pratchett’s desk, his six (yes, six!) monitors dominating it. Meat Loaf’s Bat Out Of Hell album playing on iTunes on one screen (the man had taste! 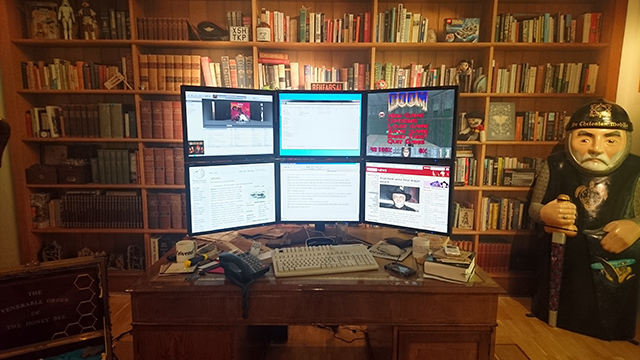 ), Doom loaded on another, the Arsenic page on Wikipedia (research, no doubt), a BBC News article about his first major award win, the obligatory file window and the Night Watch novel being typed into a Word document, as if the ghost of Terry Pratchett was sat there typing as a teary-eyed Discworld fan looked on. The Luggage sat quietly next to Terry’s desk. I kept a close eye on it. It’s well known for being “half suitcase, half homicidal maniac” and fiercely defensive of its owner. Many people and creatures have been eaten by this suitcase on hundreds of little legs and I didn’t want to risk upsetting it! The Octavo sat in one corner of Terry’s recreated office. I didn’t look too closely at the book as it has a mind of its own and a spell once decided to live in Rincewind’s head. 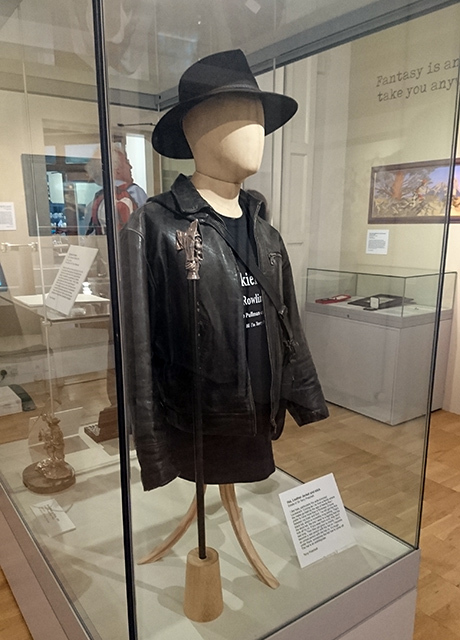 Terry Pratchett’s hat, leather jacket and stick. Terry’s trademark hat, leather jacket and stick stood encased in glass with a description from Terry. Apparently, he preferred to have more than a thickness of bone between his brain and God! 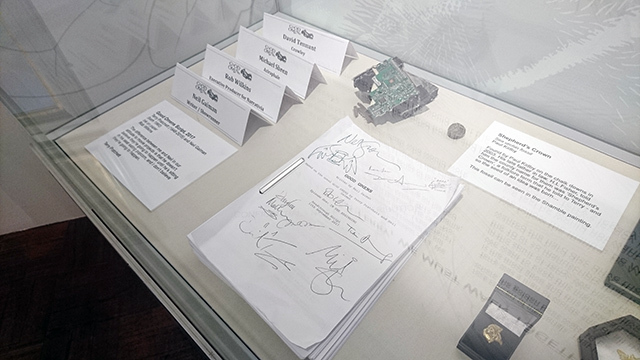 Alongside Terry’s smashed hard drive was the script for the new Good Omens TV series (something which Terry sadly never got to see made), signed by Neil Gaiman and the cast (including David Tennant and Michael Sheen). Other personal items in the exhibition included his knighthood insignia and his own sword made from iron ore and thunderbolt iron and finished with silverwork, a Blue Peter badge (I always wanted one of those, didn’t everybody? ), his sketches and more. 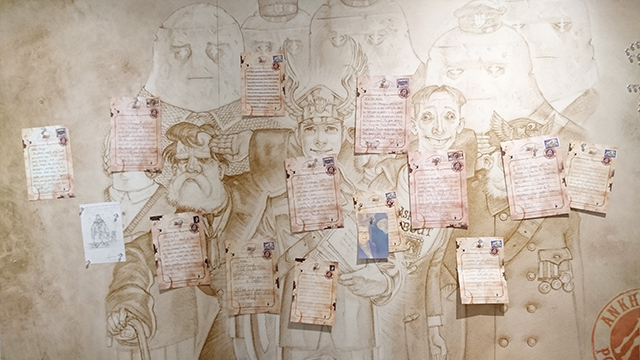 This exhibition is Terry Pratchett’s life in his own words, punctuated by artwork and possessions. His words adorn the walls and sit next to his possessions. From this headmaster telling him he would never amount to anything (how wrong was he?!) to test papers from 2009 and 2010 showing the effect his form of Alzheimer’s (Posterior Cortical Atrophy) was having on his ability to draw and write. There’s fun to be had here too. Dress up as a Discworld character and feed your memories of Terry to the talking Discworld postbox. 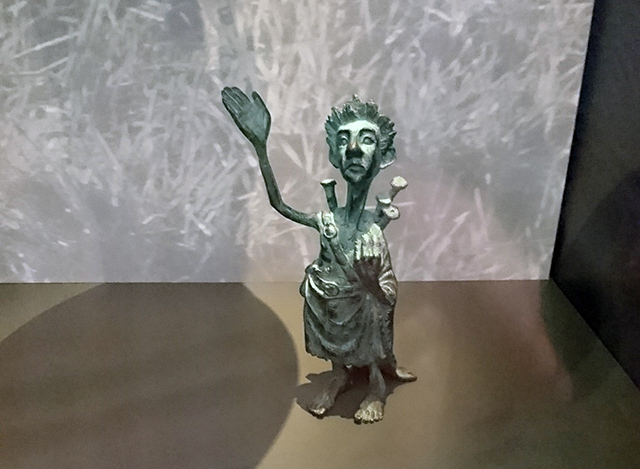 I loved visiting the Terry Pratchett: HisWorld exhibition. I found it moving and very interesting. 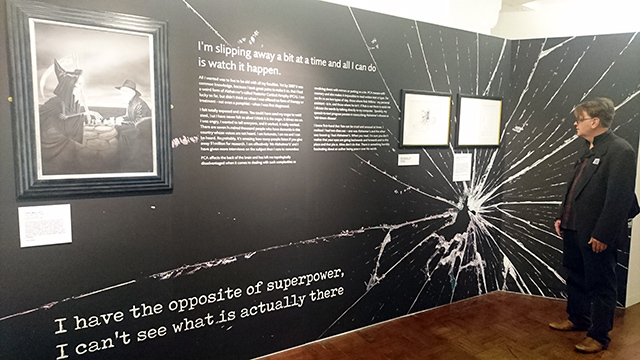 It’s currently only a temporary exhibition, but I think Sir Terry Pratchett deserves something more permanent. I could visit the exhibition time and time again if I lived nearby. I certainly hope I’ll get to visit it again before it closes. The staff and volunteers at Salisbury Museum are very knowledgeable about Terry Pratchett and Discworld. One woman kept appearing to point things out and make sure visitors didn’t miss out on the interactive features of the exhibition. 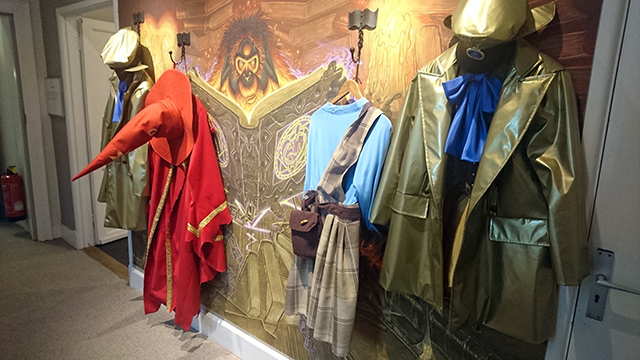 Be sure to browse the museum shop for Discworld memorabilia before you leave. I picked up a hardback book called Terry Pratchett: HisWorld, published for the exhibition. 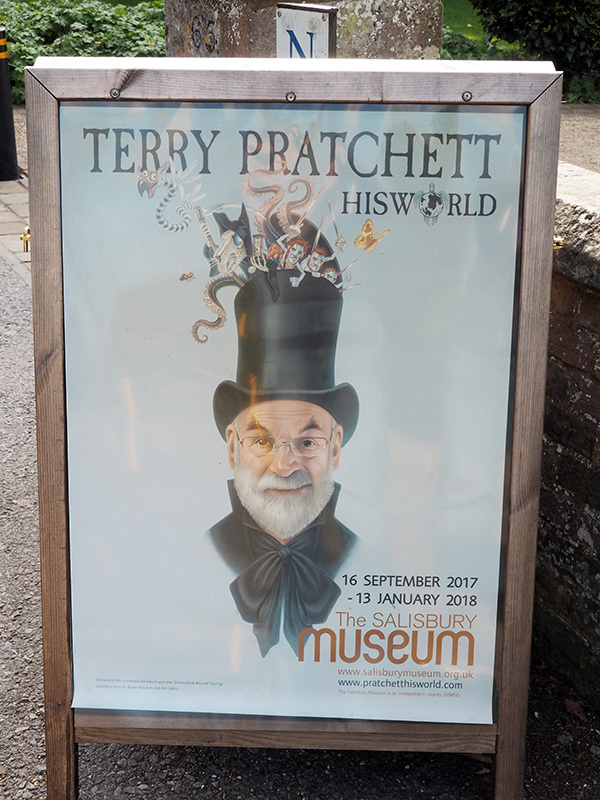 The Terry Pratchett: HisWorld exhibition runs until Saturday, 13th January 2018. Normal Museum admission charges apply. Tagged author, discworld, exhibition, paul kidby, salisbury, terry pratchett, travel. 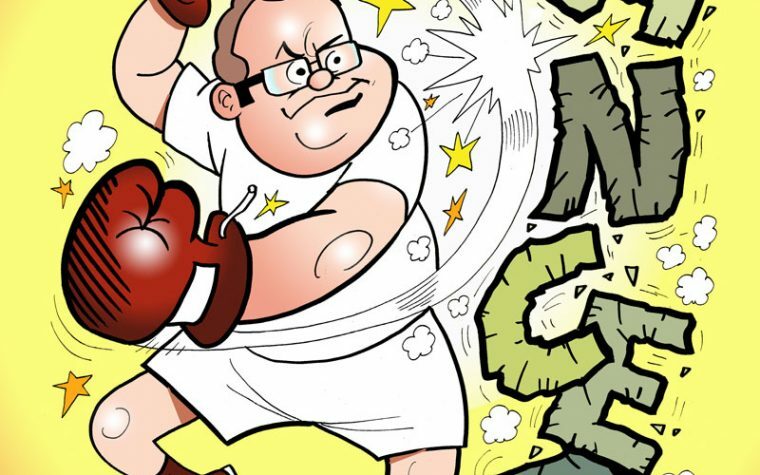 Thank you for this write up – I didn’t know about it and now I have to go! What a wonderful exhibition for any Terry Pratchett fan. I’ve never read any of his books but the exhibition looks so interesting that I think I’d still enjoy it. I’ve not read any of his books, either, but this looks like a fantastic exhibit and does tempt me (though I know I’d have a lot of catching up to do!). Ooo – nice review! I love Terry Pratchett. I am not a fan of fantasy stories, so have never read any of Terry Pratchett’s books, although keep it to yourself, as I must be just about the only person in the country who hasn’t! Hubbie has a lot to do with Visit Wiltshire in Salisbury, as well as us having a Treasure Trail in and around Cathedral Close, so he knew all about the exhibition, although he had neglected to mention it to me! The museum were expecting the exhibition to be well supported, but I think they have been a little amazed by just how much attention it is receiving. 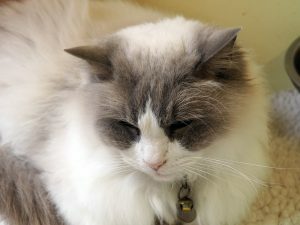 Hi Yvonne, Every visitor I saw at the museum seemed to be there for the exhibition. A Salisbury Cathedral post will be appearing shortly, as well as a Stonehenge one. Salisbury is a lovely place and I hope to be back down there again soon. I had absolutely no idea this was on, and I was only in Salisbury last week! Not to worry I will be back there later in the month and will be sure to call in. I was in Salisbury last Thursday/Friday! I have heard of the Discworld Emporium, but don’t tend to drive that far (my visit to Southampton & Salisbury was by train), so I don’t know when I’ll get to visit Wincanton. I hadn’t heard about this – it sounds brilliant! I have yet to read his work, but I do have them all on my wishlist. This looks so creepy and cool! I would love to go and this makes me want to pick up his books sooner than I anticipated! Wow that looks amazing. I would love to get my hands on that spell book! Oh my goodness Mr T, a big fan of this author, would love to see this… in fact which bibliophile wouldn’t? Some great photos, it looks every bit as good (and then some) as I’d imagined. Thank you so much for sharing. A remarkable man, with many many brilliantly funny books. I’ve laughed out loud on may a bus ride reading them. Looks like a lovely tribute. Would love it to tour and end up in Ireland. How exciting – I didn’t know about this, but it sounds popular, and hopefully will ead to something more permanent.